Protect your iPad with one of our glorious iBallz Shock Absorbing Harnesses [no longer available]. These balls of fun which slot over the corners are made from rubber, elevating your tablet to avoid spillages and absorbing shock – perfect if you’re a tad clumsy! Choose from classic black, steel grey, neon pink and vibrant teal. If you figuratively place your mobile on a pedestal, then The Wedge is the perfect product for you to show it how much you really care. Acting as a sort of bean bag for phones (only the best for Apple), this brightly coloured triangle is the ideal prop for your phone – perfect for watching TV or movies on your phone, FaceTime or for those times you just don’t want to pick up your handset. Available in grey, pink, black, blue and red at a discounted price of just £4.99! With these sensational offers you really don’t have an excuse not to treat yourself, and your phone! Our Thor costume is ideal for anyone who's interested in Greek mythology, the comic books that were derived from those myths, and the blockbuster movies that were based on those comics. We can't provide the hammer, unfortunately, and nor do we have the necessary licence to sell you the power over lightning. We can give you muscles, though; big foam muscles that will make you look just like Chris Hemsworth. Then we have our Iron Man costume - we hope red is your colour! If you loved watching Robert Downey Jr. zooming around while AC/DC played in the background, you'll go nuts for this outfit; it's second only to the Iron Man suit built by Tony Stark himself. We all get angry sometimes, but very few of us have experienced the phenomenon known as 'hulking'. If you want that to happen, your best bet is our Hulk costume - not unlike the Thor outfit, it comes with a padded muscle chest that might convince people you go to the gym every so often. And finally, there's our Captain America costume. Perhaps not anyone's first choice (all the cool kids want to be Iron Man, surely?) but his film was the best and that's why he still has a place in our hearts. Whether you just need your own costume or a group costume idea that you can tackle with a few friends, our Avengers costumes truly are awesome. Don't forget to order yours in time for Halloween! Star Wars iPhone 4 Cases Now Just £1! We're selling Star Wars iPhone 4 cases for a quid, that's all - one pound! We like to think we offer you a wide selection of well-priced gadgets, but this offer really is out of this world! This is the bit where we talk briefly about Star Wars and phone cases: we know that most of you gadget lovers will also be massive Star Wars fans, and we're with you on that one! As such, we're not going to insult your extra-terrestrial intelligence by explaining who R2-D2, Darth Vader, and a stormtrooper is. What we can tell you is that you can have their iconic effigies emblazoned on your iPhone 4 for just a pound! What can you buy with a pound these days (we say sounding a little like a war-veteran)? We know it is not much! You cannot even buy two small Mars bars for £1; so why not save your money, stretch your imagination, and get something from deeper into space still - these awesome Star Wars iPhone 4 cases! Who remembers the Micro Drone? It was a big seller here on Gadget Inspector last year, and so it gives us great pleasure to announce the imminent arrival of Micro Drone 2.0. This new and improved version of our favourite quadrocopter is set to go down a storm this autumn, and while we're reluctant to start thinking about Christmas presents this soon (heck, we haven't even had Halloween yet), we're pretty sure that anyone would be pleased to find a Micro Drone under the tree come December the 25th. 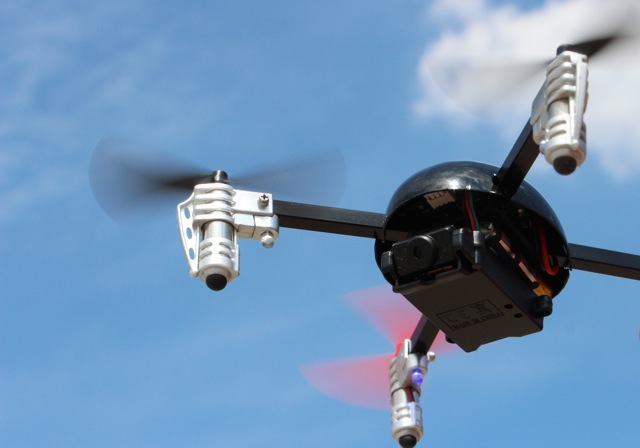 HD Video Camera - The new Micro Drone is capable of filming its flights with a high definition, 720p camera. Record video footage, take photos, and save it all to the drone's micro SD card. Unprecedented Stability - So you thought the old quadrocopter was a stable flier? Boy, you ain't seen nothing yet. Not only does this new version come with even smoother handling, it's got a clever little algorithm built into it so that it can recover after being thrown into the air. Stronger Structure - And if you do somehow manage to crash your quadrocopter, don't panic. The robust metal construction is design to withstand all manner of turbulence and poor landings. Everything bolts together to form one spectacularly sturdy whole. Super Speed - The new Micro Drone's motor goes at 29,000rpm, a mind-bogglingly high figure. If you can keep up with that speed, you'll get a seriously thrilling flight out of it. The new Micro Drone quadrocopter will be arriving here at Gadget Inspector next week. We're excited, and we're sure you are too. We'll let you know when the drones arrive, but in the meantime, have another read of our 10 Things to Do with a Micro Drone blog and remind yourself of how to use one. Stay tuned! We have some really cool gadgets that are sure to make excellent gifts for gizmo-lovers, or even yourselves! Everybody loves cool gadgets, and we are constantly scanning the markets to make sure our range is fresh! Take this fine 50 calibre shot glass as an example. Cool gadgets like this heavyweight shot glass definitely have something pretty neat about them - just imagine handing out 50 calibre bullets replicas filled with your favourite tipple, that's one way to make sure your night goes off with a bang! Each shot glass also comes with its own bullet chamber-style stand to stop it tipping over, though we cannot promise you'll stay as upright! 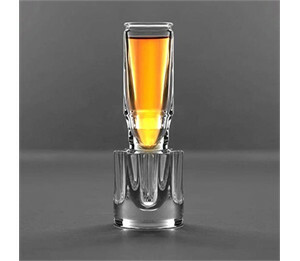 Made from resistant borosilicate glass these bullet shots are extremely tough - this means that your shot glass should hold up no matter how hazardous conditions get! This is just one of a whole website full of glorious gadgets. If you enjoy gizmos and products with the 'woah' factor give our website a browse. We have a range to whet the appetite of any gadget-lover, or anyone who enjoys items that little bit special.